An Ohio dad is the first to sue the manufacturers of football helmets over the death of his son. This is the first CTE-related suit to be brought against helmet-makers. 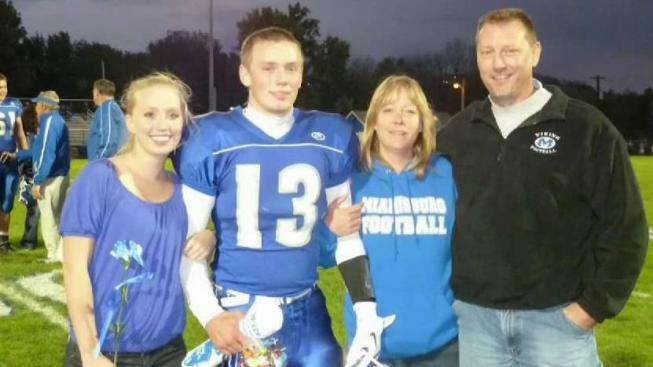 An Ohio man filed a wrongful death lawsuit against two of the country's largest football helmet manufacturers, alleging their products failed to protect his deceased son and didn’t provide an adequate warning message for athletes’ parents. The lawsuit, filed last week in Montgomery County, Ohio, names Riddell Sports Group and the parent company that owns Schutt Sports as defendants. In the first case to be brought against helmet makers, Darren Hamblin claims his son died from brain damage caused by playing youth and tackle football, according to court documents. After Cody Hamblin's death, doctors studied his brain and determined the 22-year-old had Chronic Traumatic Encephalopathy (CTE), the degenerative brain disease attributed to receiving numerous concussions. CTE, which can only be diagnosed in an autopsy, has been found in the brains of more than 100 former football players, according to NBC News. "The helmet manufacturers need to take responsibility," Hamblin told NBC affiliate WCMH. "For a product that's not made for kids." Cody died during Memorial Day weekend in 2016. He was aboard a boat fishing with his grandfather when he had a seizure and fell into the water. He drowned within a minute, according to the documents. He starting playing football when he was 8 years old and played through high school. Hamblin said in the lawsuit, which alleges fraud, negligence and wrongful death, that the helmets didn’t provide enough protection. Riddell has not yet replied to NBC's request for comment. Schutt doesn't comment on current or pending litigation, a company spokesman said. Stickers on the back of each helmet state the helmets meet the National Operating Committee on Standards for Athletic Equipment safety guidelines, the non-profit’s standards for safety. However, manufacturers test their own helmets and report their own conclusions, meaning there is no government oversight in the process. "They need to either make one that is for kids that can protect kids," Hamblin told WCMH. "Or they need to just flat out say this is not intended for helmet contact." In February, two San Diego mothers filed a lawsuit against Pop Warner Football, suggesting the organization misrepresented safety as its primary priority. The women's sons both died by suicide and were later found to have had CTE. Hamblin’s lawsuit comes about four months after three former NFL linebackers suggested kids younger than 14 years old play flag football, citing safety concerns. Forty-eight percent of Americans said they would recommend their child play a sport other than football in a February NBC News/Wall Street Journal poll. "I'm tried," Hamblin told WCMH. "I'm convicted and I'm sentenced every day I get up. Sometimes multiple times in the day, because I have that much guilt." The National Suicide Prevention Hotline (1-800-273-8255) is open 24 hours a day, 7 days a week.